Lithothamnium calcareum is a marine red alga that grows in the cold Atlantic waters off the southwest coast of Ireland and the northwest coast of Iceland. 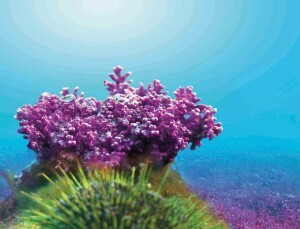 Minerals in the seawater are accumulated in the alga’s fronds during its lifetime. Eventually, the mineral-rich fronds break off the living organism naturally and fall to the ocean floor. The calcified skeletal remains are sustainably harvested, then cleaned and milled to produce a product called Aquamin®, the main component of DensiMAX™ (the secondary component is vitamin D3, which helps the body to absorb calcium). The skeletal remains of the alga. This single plant source contains a high percentage of calcium as well as other essential macro-minerals and trace elements vital for healthy bones and joints – 74 minerals in total, including magnesium, potassium, phosphorus, iron, silicon, sodium, chloride, boron, copper, sulphur, iodine, fluoride, zinc, selenium and strontium. Because the minerals and trace elements are obtained from a single plant source, they are more easily absorbed by the body. This helps to minimise the side-effects of gas and constipation that can occur when using supplements that include other forms of calcium. The alga-based calcium supplement directs calcium directly to the bone, where it’s needed, and not to soft tissue structures such as blood vessels. Build bones. It stimulates bone growth by remodelling the bone and improving bone mineral density. Protect bones by preventing calcium loss, thereby helping to protect against osteoporosis and other degenerative bone conditions. Prevent bone loss. The trace elements, together with calcium, prevent osteopaenia, reducing bone loss problems caused by ageing, particularly in post-menopausal women. Better bone health improves mobility in later life. Actively reverse bone loss by providing all the elements essential for bone remodelling in conditions such as osteopaenia, osteoporosis and fractures. Reduce inflammatory response in patients with arthritis. Although safe to use with few side-effects reported, it is advised that you check the mineral content of Lithothamnium calcareum if you are concerned about the levels of these minerals in your body. Always consult your healthcare practitioner before embarking on a course of natural remedies. No records were found to suggest that Lithothamnium calcareum is used in domestic cuisine in South Africa. However, in countries where Aquamin® is available in powder form, it is and can be used to fortify the calcium content of nutritional- or food products. The alga grows naturally in the cold Atlantic waters off the southwest coast of Ireland and the northwest coast of Iceland. Aslam, M. H., Kreider, J., Paruchuri, T. et al. A Mineral-Rich Extract from the Red Marine Algae Lithothamnion calcareumPreserves Bone Structure and Function in Female Mice on a Western-Style Diet. US National Library of Medicine. Ryan, S., O’Gorman, D. M., Nolan, Y. M. Evidence that the Marine-derived Multi-mineral Aquamin has Anti-inflammatory Effects on Cortical Glial-enriched Cultures Phytotherapy Research. May 2011. US National Library of Medicine. National Institutes of Health.